Here is the successor-version of my theme "Mr. Theo Bottomfeeder Black" - Availiable in English and German GUI language. A little more modern, fewer screens and therefore clearer. But all the necessary features of "Mr. Theo Bottomfeeder Black" are included. Here my second Theme for the DNA75C/DNA250C (tested on Therion BF 75C, Rebel BF 75C and Boxer BF DNA250C) available in english and german language. For using the Theme "Mr. Theo Bottomfeeder LED" with the new Replay-Mode, you need the following Firmware on your Device. Otherwise this Theme can not be installed. Function of the lower right symbol in Mainscreen switches in all screens (except Lockscreen and Mainscreens) either back to Mainscreen 1 "Bad Eyes" or Mainscreen 2 "More informations" depending on the selection of the switch "Mainscreen" in the screen "Display". Due to the limitation of the software, the Mainscreen 1 "Bad Eyes" will always be displayed after unlocking the device, even if Mainscreen 2 "More informations" is activated as Mainscreen. 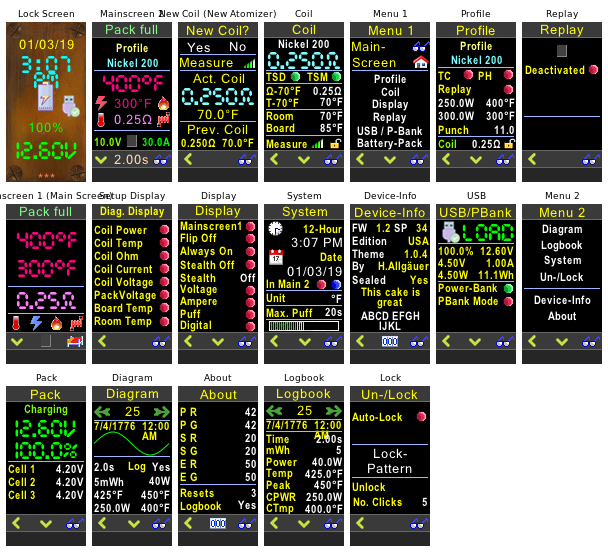 In this case, the Mainscreen 2 "More informations" can be accessed again by simply clicking on the lower right icon. Do never enable the "Puff saved, playing" checkbox in the profile settings of your EScribe program. Check this setting if Replay does not work as expected. So just activate the checkboxes "Use replay on this profile". Additionally the words "Replay" "active" are displayed in big yellow chars on both Main-Screens of the Theme. Hier die Nachfolge-Version meines Themes "Mr. Theo Bottomfeeder Black" - verfügbar in deutscher und englischer GUI-Sprache. Etwas moderner, weniger Screens und dadurch übersichtlicher. Aber dennoch sind alle notwendigen Funktionen von "Mr. Theo Bottomfeeder Black" enthalten. Hier mein zweites Theme für die DNA 75C/DNA250C (getestet mit Therion BF 75C, Rebel BF 75C und Boxer BF DNA250C) in englischer und deutscher Sprache. Zur Verwendung des Themes "Mr. Theo Bottomfeeder LED" und des neuen Replay-Modus benötigt Ihr folgende Firmware auf Eurem Gerät. Ansonsten kann dieses Theme nicht installiert werden. Funktion des unteres rechtes Symbols in Mainscreen schaltet - abhängig von der Auswahl des Schalters "Mainscreen" im Screen "Anzeige" - in allen Screens (ausser Lockscreen und Mainscreens) entweder zurück auf Mainscreen 1 "Bad Eyes" oder Mainscreen 2 "Mehr Informationen". Bedingt durch die Limitation der Software wird nach dem Unlock des Gerätes immer das Mainscreen 1 angezeigt, auch wenn Mainscreen 2 ("Bad Eyes") als Mainscreen aktiviert ist. In diesem Fall kann das Mainscreen 2 "Mehr Informationen" durch einfaches Anklicken des unteren rechten Symbols wieder aufgerufen werden. Aktivieren Sie in den Profil-Einstellungen Ihres EScribe-Programms nie die Checkbox "Puff saved, playing". Kontrollieren Sie diese Einstellung, wenn Replay nicht wie erwartet funktioniert. Aktivieren Sie also einfach nur die Kontrollkästchen "Use replay on this profile". As I already have stated it's a great, really great, theme. One remark only. In your other theme (Black) and up to version 2.0.7, using the Theme Designer, I was able to modify one indication in the main screen. That is, instead of showing the Atomizer Voltage to show the "Statistic -Last Puff Power", just after releasing the fire button. In versions 2.1.2 and 2.1.3 that cannot be done as well as cannot be done in this LED theme! 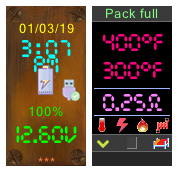 Although I change the indication and it is reflected in the Main Screen, when I upload the changes to the mod, it continues to show the voltage. Thank you for all the effort you put into this. I've been using this theme since the day it was released. Wo finde ich die Möglichkeit, erst mehrere Züge zu machen, bevor ich für Replay manuell speichern kann? Weil anscheinend wird der Zug im Moment automatisch gespeichert. Finde es etwas umständlich, nach jedem Zug Replay zu deaktivieren, mit den Einstellungen herum zu spielen, und und dann erst Final bei passendem Dampf-Empfinden zu bleiben. Da wäre mir eine manuelle Übernahme lieber. Den Hinweis zum deaktivieren von"Puff saved playing" könntest Du ja vielleicht weiter nach oben in die Beschreibung packen, damit das von vorn herein klar ist. danke für Deinen Kommentar und die Anregungen. Es freut mich, dass Dir mein Theme gefällt. Ich habe nun den "Vorsicht"-Abschnitt in der Beschreibung der Replay-Funktion an den Anfang verschoben. Wenn Du dieses Theme in reiner schwarz-Weiss-Darstellung (farbig sind dann nur die Symbole) habne möchtest, kannst Du Dir die etwas umfangreichere Version "Mr. Theo Bottomfeeder Black" installieren. Wenn dieses Theme "Mr. Theo Bottomfeeder LED" bei den Usern gut ankommt, kann ich ggf. auch eine reine Schwarz-Weiss-Version dieses Themes entwickeln und hochladen. Thanks for your comment and the suggestions. I am glad to hear, you like my theme. I have now moved the "Be Aware" section in the description of the Replay function to the beginning. If you want to get this theme in pure black-and-white representation (only the symbols are colored), you can install the slightly more extensive version "Mr. Theo Bottomfeeder Black". If this theme "Mr. Theo Bottomfeeder LED" is well received by the users, I could possibly also develop a pure black and white version of this theme and upload.